Country Craft's T-5 Narrow Trellis has a tight lattice design making it easy for you to train your plants to grow upward for a lush full look. At only 18" wide this is the perfect trellis for those smaller spaces or multiple units can be used to cover a wider area. This trellis provides the perfect structure for plants such as Wisteria to twine around and attach themselves while showcasing their beautiful blooms. 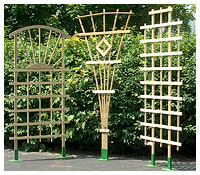 The T-5 trellis can provide your landscape with extra privacy or hiding an unsightly eyesore while at the same time showcasing your favorite flowering vines.